Large department store on the corner of North End and George Street. As of late November 2014, the Croydon Advertiser reported (on a now-deleted webpage) that it was due to be relaunched under the name "Zervo". However, this never seemed to happen; the signage never changed. 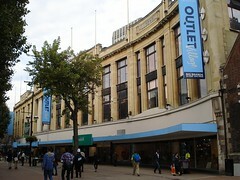 It opened as Croydon Village Outlet in September 2013 in the premises previously occupied by Allders photo. However, as of June 2014 most of the departments have departed, including everything in the food hall except the Dash Coffee Co. Accessibility: Allders used to have step-free access to all floors via lifts and ramps, which seems to mostly still be in place. However, we haven't checked this thoroughly. Allders was a large department store on the corner of North End and George Street with additional access via the Whitgift Centre. It went into administration in 2012 and finally closed down in September 2012. However, Allders Mall, the "corridor" through the store with several independent traders, was still in operation as of December 2012, and according to the Croydon Advertiser (webpage now deleted) had been renamed to North End Mall. In addition, a new "outlet centre" called Croydon Village was announced to open in September 2013 in the space vacated by Allders, and this did in fact happen. According to the Croydon Village Outlet store directory as of October 2013 photo, the departments included furniture, clothes, luggage, stationery, shoes, cosmetics, fashion accessories, perfume, books, electrical goods, kitchenware, haberdashery, and toys. However, as of late October 2013 the haberdashery and book departments at least weren't in place yet (according to a member of staff the haberdashery probably won't be in until early 2014). (There was also a space for a sushi place called Tokyo Soul, but this wasn't open on our last full walk-through, and as of December 2013 it had been replaced by a burger place.) There was some seating for eat-in. Existence last checked in June 2017. Last edited 2019-01-22 18:04:54 (version 69; diff). List all versions. Page last edited 2019-01-22 18:04:54 (version 69).